In 2010, the name BENU saluted the impressive genesis of the MORITZ GROSSMANN GLASHÜTTE I/SA brand. As the young manufacture's first manually wound watch, the BENU embodies the horological precision of Moritz Grossmann, the elegance of his timekeeping instruments, and conceptual aspirations of the watchmakers at Grossmann in the 21st century. Their ambition is to meld micromechanical ingenuity and traditional artisanship with latest-generation technology in the form of exclusive masterpieces that epitomise high-end watchmaking. The appearance of the BENU Tourbillon reflects the lineage of its model line. Its slender three-part case in 750/000 white gold tapers out along the gently curved strap lugs. The elegant narrow bezel directs the focus on the crisp displays and the aperture for the unusually large Grossmann three-minute tourbillon. The three-part solid-silver dial has a symmetric face. To make the decorative element of the tourbillon at 6 o'clock consistent with the accurate legibility of a precision timepiece, the seconds and hours are displayed on two recessed, off-centre subsidiary dials. Their manually crafted hands have distinctively different shapes. The hour hand, in keeping with its function, is more prominent to assure unambiguous readings of the time. The instrument-like appearance of the BENU Tourbillon is emphasised by the refraction of the crisp minute scale in the chamfer of the sapphire crystal. The time range from 25 to 35 minutes, which is interrupted by the tourbillon aperture, is precisely readable thanks to a rearward extension of the minute hand that sweeps the scale arc on the opposite side. A patent application has been filed for this dual minute display arrangement. Endowed with easily legible Arabic numerals and wispy-tipped, filigreed hands crafted in-house, the BENU Tourbillon stands out like a prime example of the aesthetic 19th-century precision measuring instruments for which Glashütte was acclaimed. The calibre 103.0 movement of the BENU Tourbillon represents a new concept with an array of surprising solutions. To translate into reality the aspirations of Grossmann's watchmakers with respect to precision, efficiency, and aesthetics, classic principles of horological design were critically reviewed and pivotal movement functions optimised. Amply dimensioned, the oscillator with the Grossmann balance is integrated in a unilaterally suspended, “flying” tourbillon cage according to Alfred Helwig (1886-1974). The famous watchmaker strongly influenced the evolution of Glashütte as a stronghold of German watchmaking. Alfred Helwig was a teacher at the German School of Watchmaking from 1913 to 1954; in 1920, he applied for a patent for the flying tourbillon. In 1922, he earned his master craftsman's credentials with a unilaterally suspended five-minute tourbillon. Originally, the tourbillon served the purpose of offsetting gravity-induced rate deviations in pocket watches that were worn vertically. Today, a well-formed tourbillon ranks among the genuine challenges for master watchmakers. As the author of the book entitled “Drehganguhren”, Alfred Helwig was a source of inspiration for Grossmann's calibre designers while they were developing their three-minute tourbillon. Given the ambitious expectations imposed on a precise manually wound watch, the classic lever escapement was reworked for the BENU Tourbillon. Because of the use of a pallet lever with unequal arm lengths on a shared locking circle, all entrance and exit adjustment points are on the same lever arm, and even slight deviations can be precisely rectified. The pallet lever is composed of two parts: a thin fork with a blade-type guard pin, fashioned in the manner of Glashütte pocket watches, and the lever body with the visible sapphire pallets. The deflection of the lever is limited by a pin at the extension of the fork, which significantly improves the lever's mass distribution and equilibrium. The spatial configuration of the balance and hairspring in the tourbillon cage was optimised for the BENU Tourbillon. 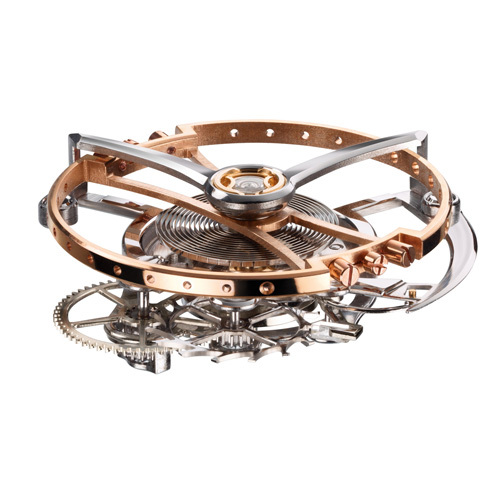 The hairspring is attached upside down to the lower cage base beneath the Grossmann balance, resulting in an even more exquisite balance bridge design. Optimised for artisanal manufacturing techniques, the design of the Grossmann balance improves the adjustability of inertia and achieves high kinetic energy combined with minimised air resistance and the smallest possible mass. The number of screws in the balance wheel rim was minimised, and the bores in the rim are equidistant. This makes it possible to vary the moment of inertia by inserting screws with different head lengths in the bores. 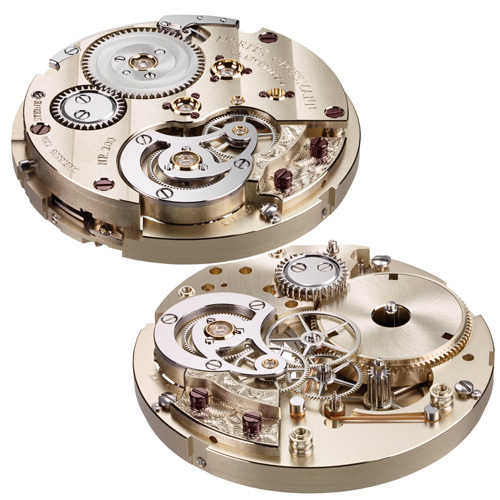 The Grossmann balance interacts with a Nivarox 1 balance spring. 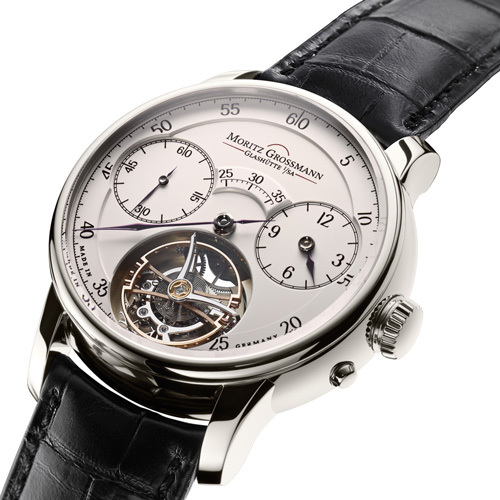 Its terminal curve is overcoiled according to calculations performed by Glashütte regleur Gustav Gerstenberger. 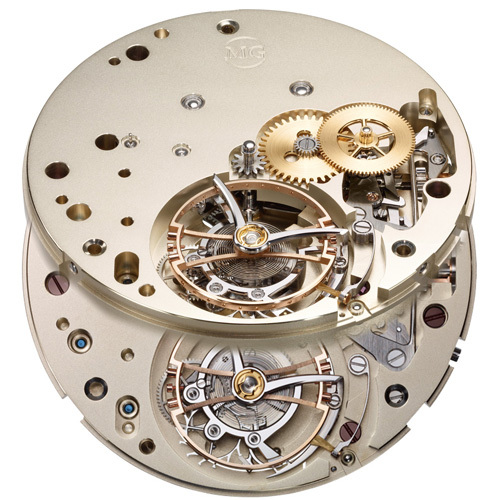 An extremely rare solution was chosen for the barrel bearings in the calibre 103.0 movement. The bilateral jewel bearings are located on the ratchet wheel and main plate sides. A gold chaton on the ratchet wheel carries the upper jewel for the mainspring barrel and tastefully complements the traditional finissage of the ratchet wheel. As customary, the lower jewel is embedded in the main plate. The mainspring barrel arbor extends through the hollow core to the chaton in the ratchet wheel; the barrel is perfectly stabilised with a maximised distance between bearings. 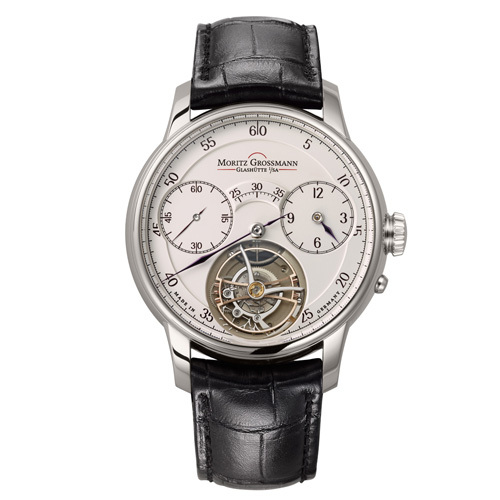 The train configuration of the Grossmann three-minute tourbillon exhibits several unusual features. To reduce the kinetic energy of the tourbillon and the exposure of the lever escapement to stress, the periodicity of the cage was extended to three minutes with an additional wheel. The pinion for the seconds is segregated from the power flow of the wheel train and driven with reduced torque. To prevent arbor and seconds-hand backlash, the pinion is constantly braked by a spring. Grossmann's watchmakers designed this function in a sustainable and maintenance-free manner by choosing guaiacum spp., an oily wood species, for the brake ring of the fourth-wheel arbor. It is classified as “rock-hard” and has good long-term tribological properties. This solution was inspired by the extremely dependable marine and tower clocks that John Harrison (1693-1776) crafted with great success in the 18th century. As a master carpenter, Harrison accrued considerable experience with various types of woods, especially the very durable ones he selected for his marine chronometers. 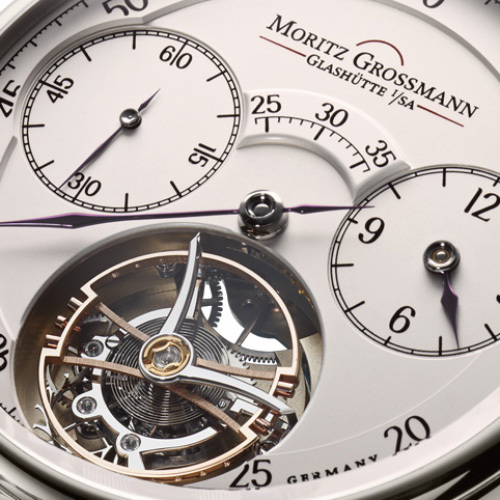 Grossmann's contemporary precision timepieces stand for HERITAGE IN TIME beyond our era. It was also a key objective to preserve the beauty of the wheel train of the BENU Tourbillon, with its precious decorations and polishes, by precluding oxidation and damage to coated surfaces. The train wheels are made of ARCAP, a copper-nickel-zinc alloy coveted for its long-lasting brilliance. Crafted from beryllium bronze, the balance has a stately presence above the silvery going train.